In September my parents and my brother and sister-in-law came to visit. 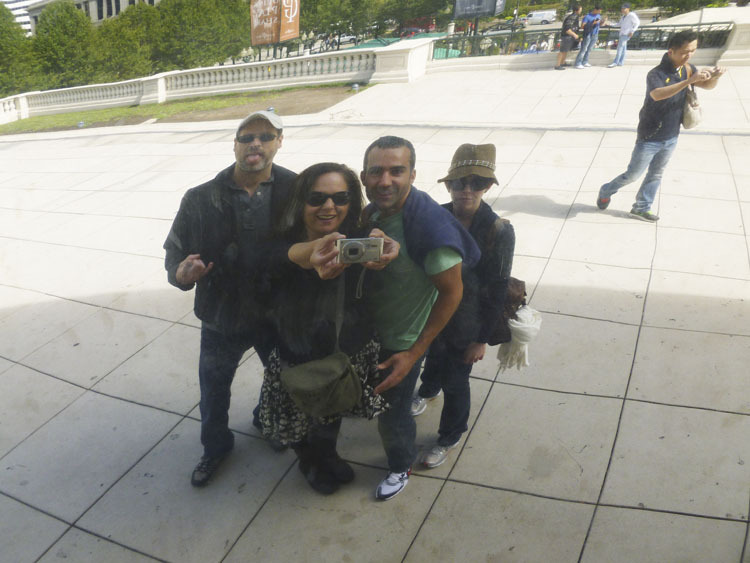 We did a lot of tourist stuff, since we were practically tourists ourselves back then. 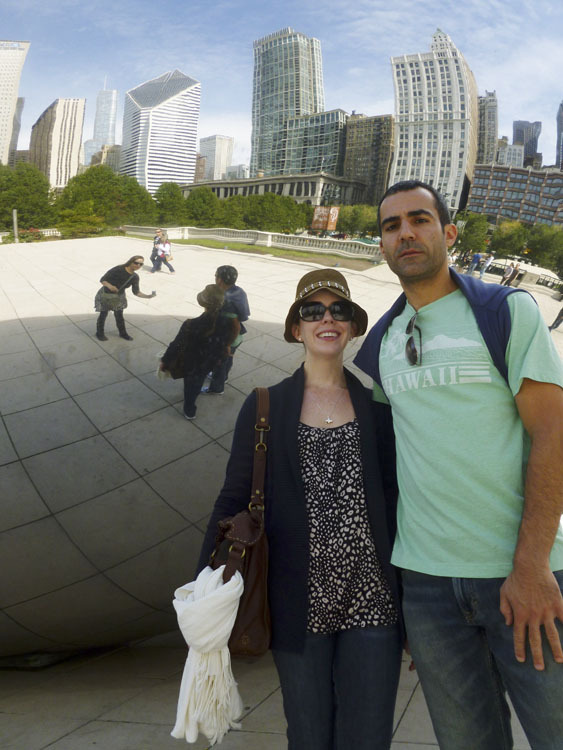 We ate a ton of good food and saw a lot of stuff, too. 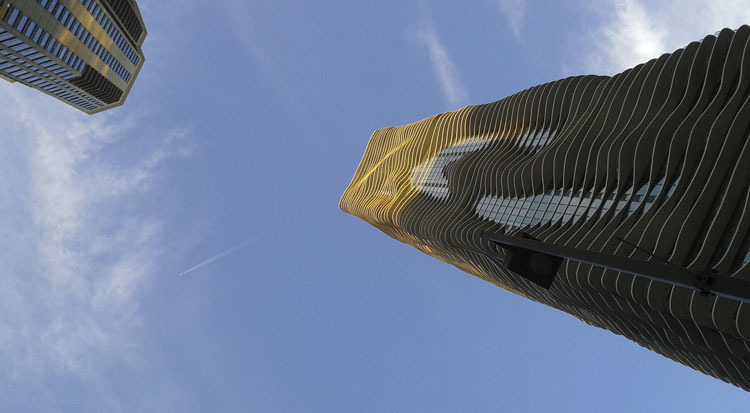 They stayed at The Aqua. It’s new and really cool. 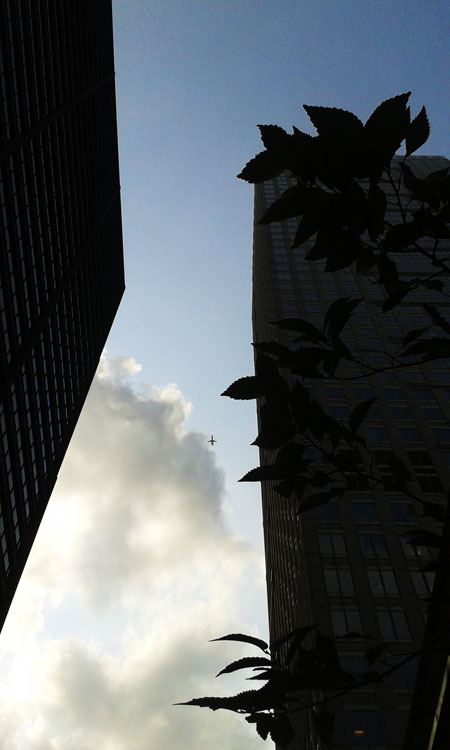 There is a hotel, condos, and apartments. 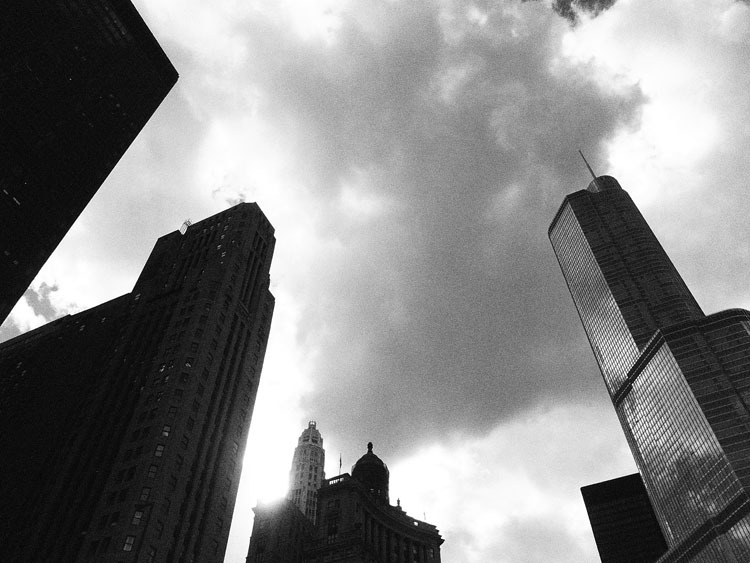 They rented a condo on the 40th floor. 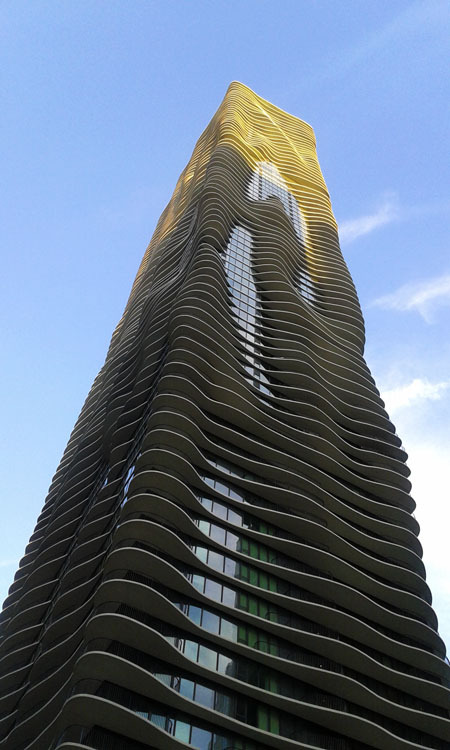 The Aqua Building was designed to look like water. Sunday we had lunch in our tiny apartment and dessert on the roof deck, then we walked from our apartment in Lincoln Park through the zoo and down into the Gold Coast and had dinner at Gibson’s Steakhouse, which was awesome. 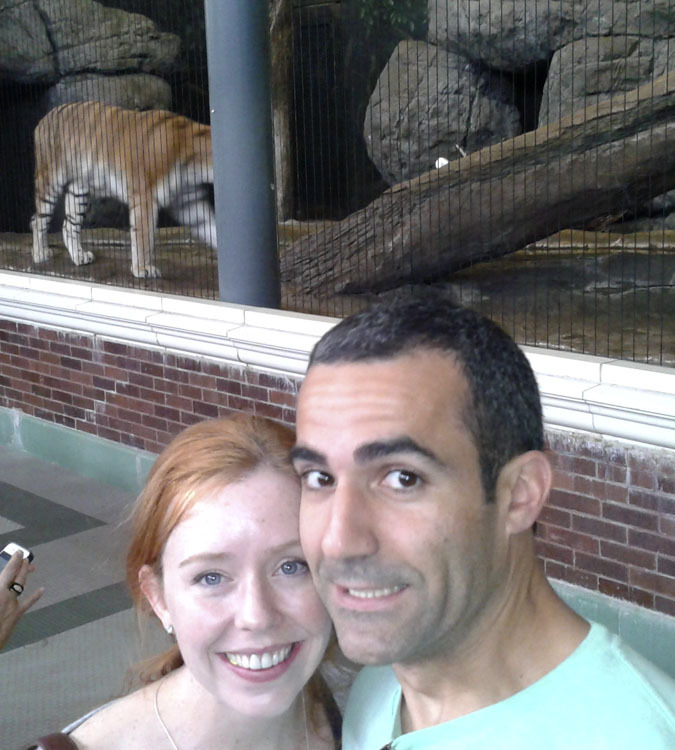 The tigers at the Lincoln Park Zoo. 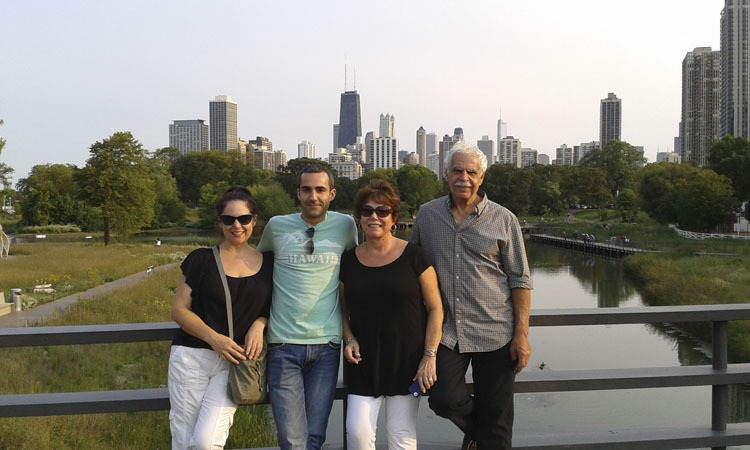 The fam in Lincoln Park. 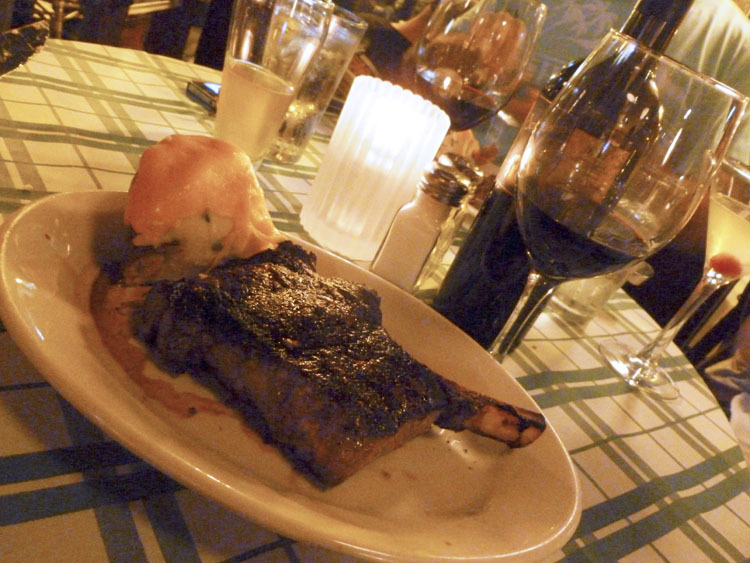 Huge steaks, delicious cocktails, sides and wine at Gibsons in Chicago. 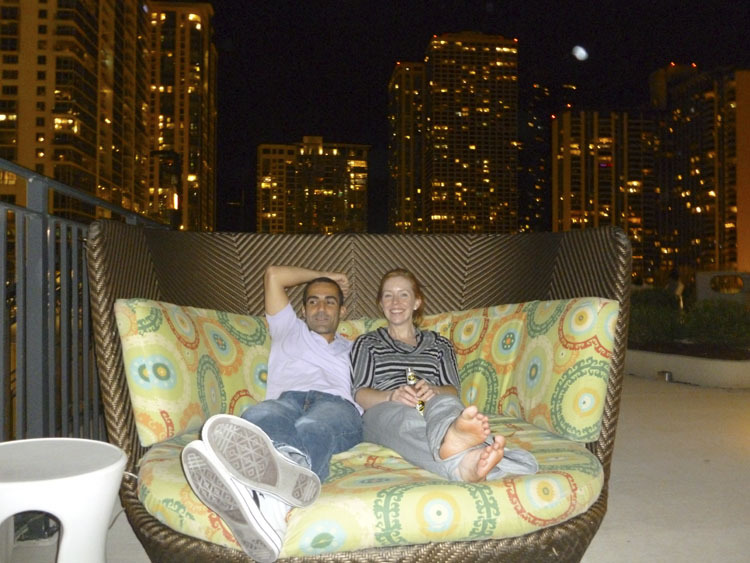 David and Sarah relaxing outside at The Aqua. 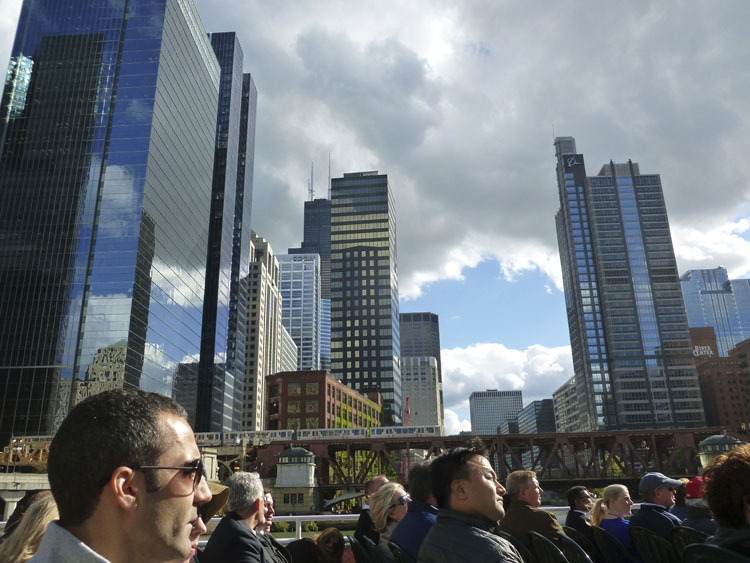 On Monday we took a tour with the Chicago Trolley and Double Decker Company. It was actually really fun and informative. Highly recommended. 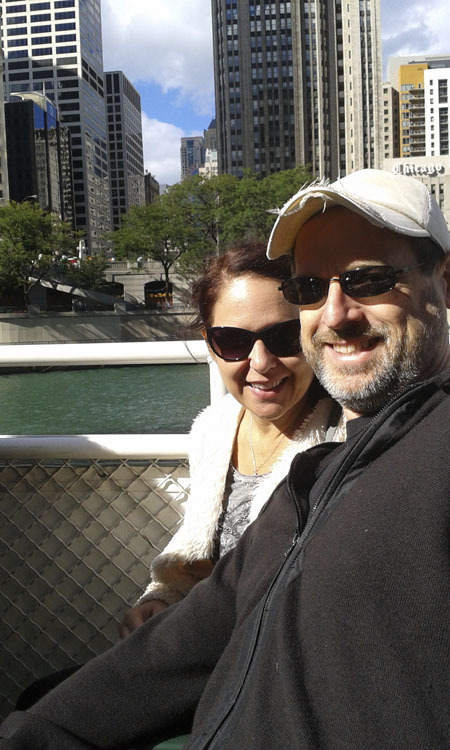 Chicago Trolley Company's Signature Tour. We sat on the top of the double decker and got some good pictures. Since the tour is “hop on, hop off” and there are designated spots to do this, we opted to get off on Taylor St. and go to Rosebud for lunch. We are serious about lunch. Sarah and David like to share entrees. Good idea, I'll share, too! 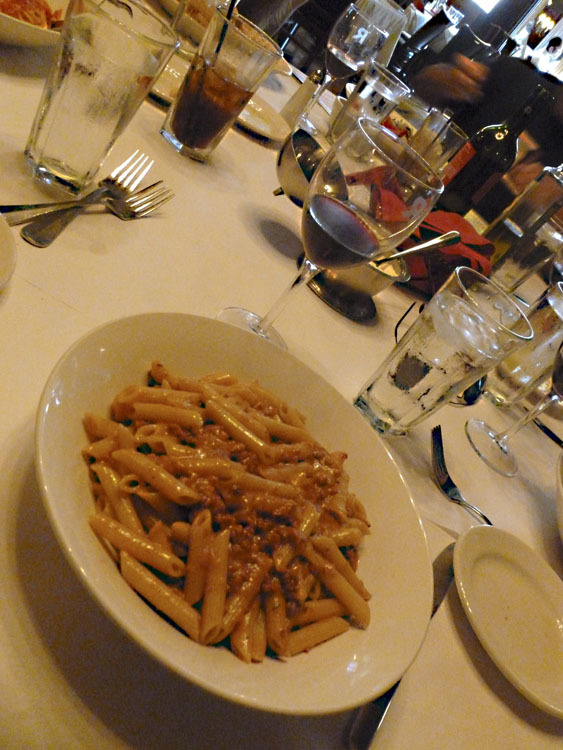 My dad had the Penne Bolognese (it was delicious). We "shared" it. 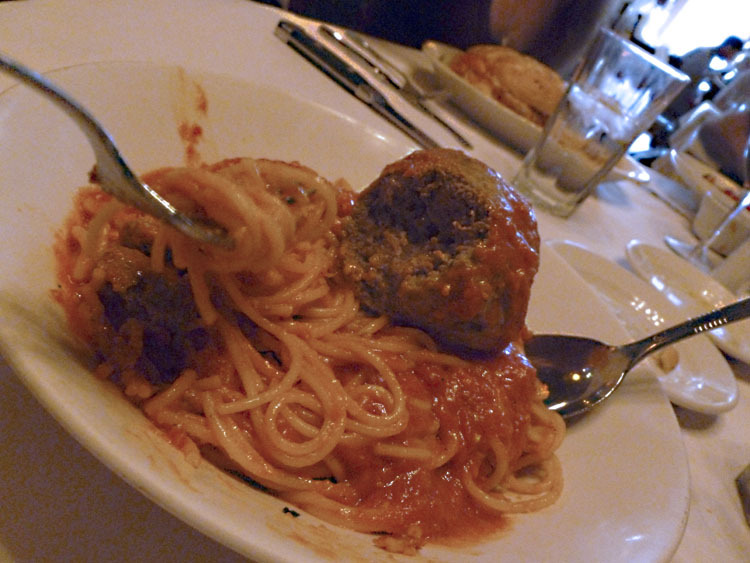 Mike had the Spaghetti and meatballs (it was delicious). I had this insane thing: Cavatelli Ala Rosebud. I still dream about this dish. It was one of the best things I've ever eaten. My dad and I were supposed to share it but I wound up scarfing most of it myself. 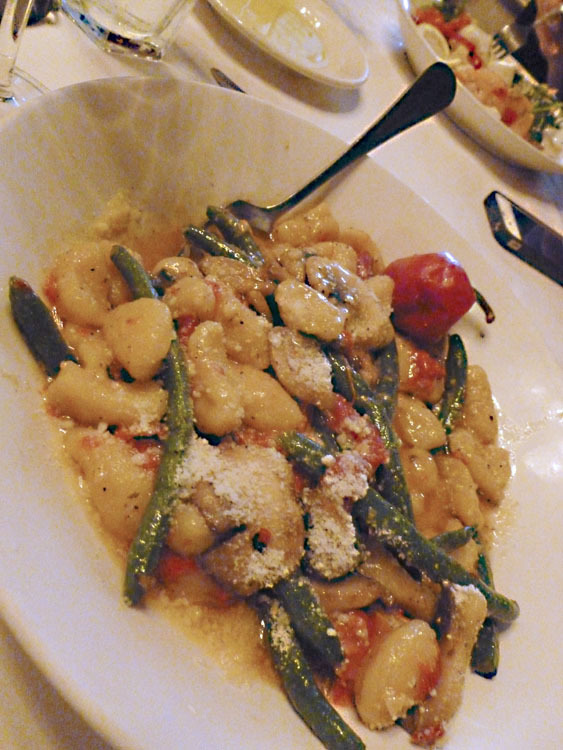 It's basically a gnocchi-like pasta with grean beans, tomatoes, peppers, and a butter sauce. OMG. 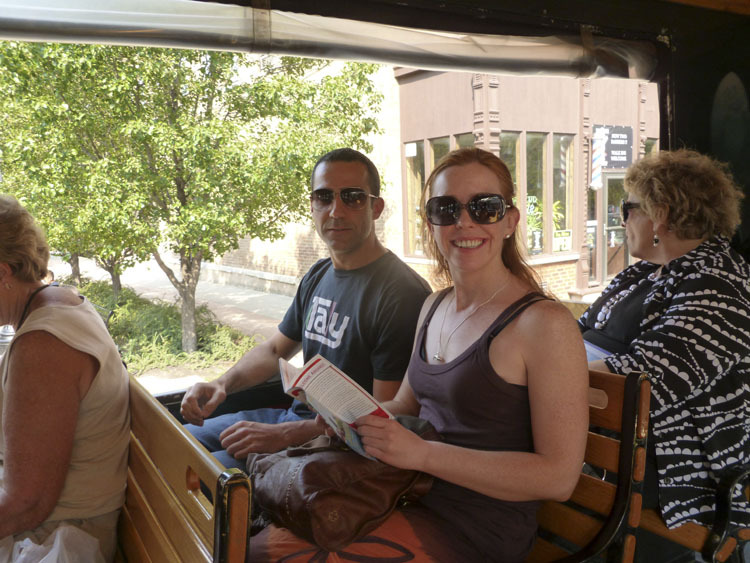 After lunch we got back on the trolley and finished the tour. 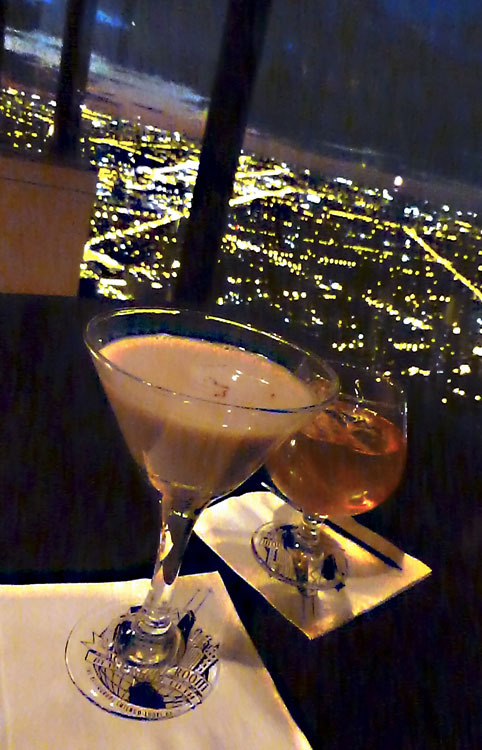 Later that night we went to the John Hancock Building’s Signature Room and had drinks and checked out the view from the 95th floor. Fancy cocktails at The Signature Room. 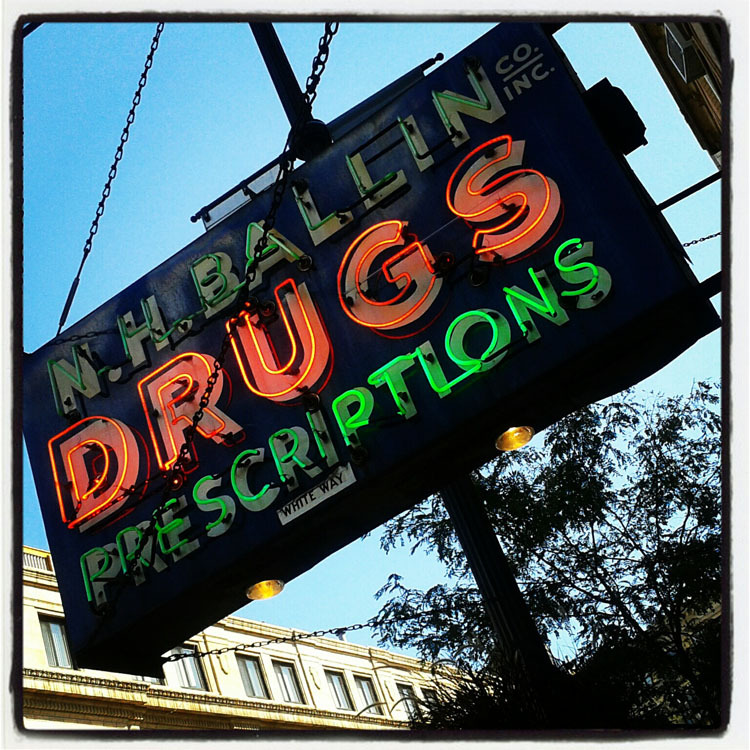 Tuesday we started out at Big Star in Wicker Park. The service was sort of lame and we felt like they weren’t that thrilled to have us non-hipsters out on their patio for everyone to see, but the food was really good. 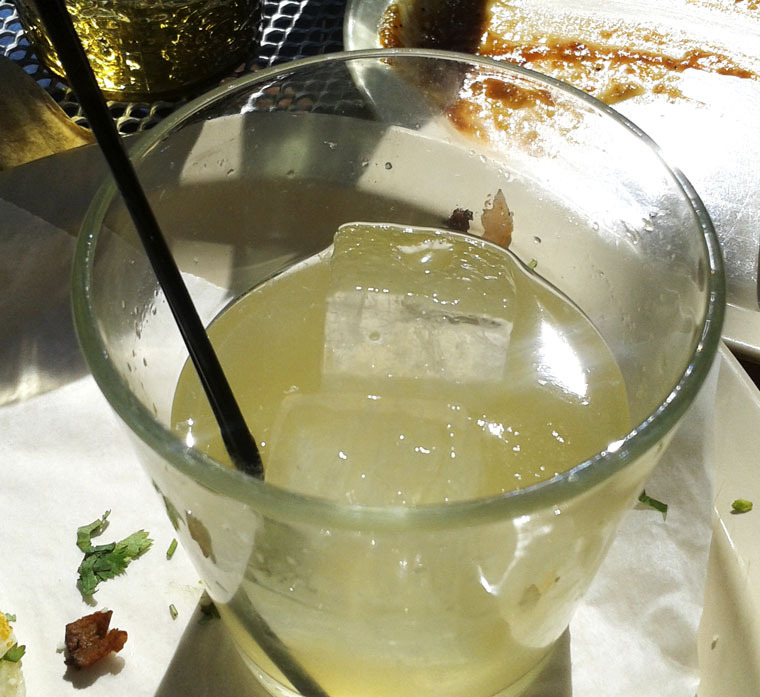 The margarita was not great, though, and overall we like Taco Joint in Lincoln Park better. 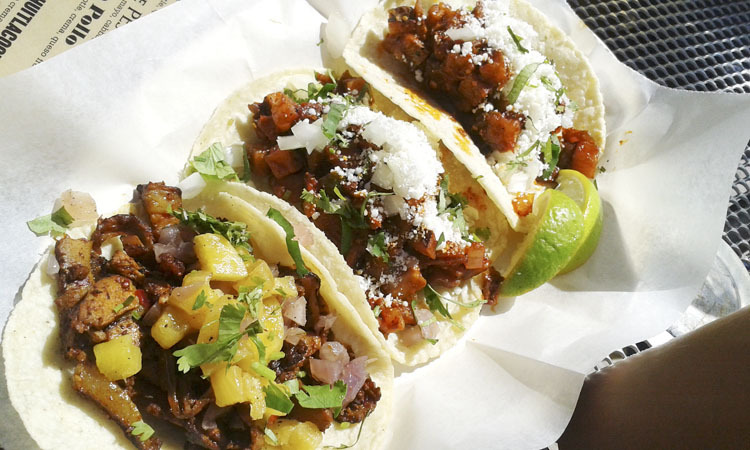 Yummy tacos at Big Star in Wicker Park, Chicago. The margarita was warm and didn't taste like anything special. Plus it was small. 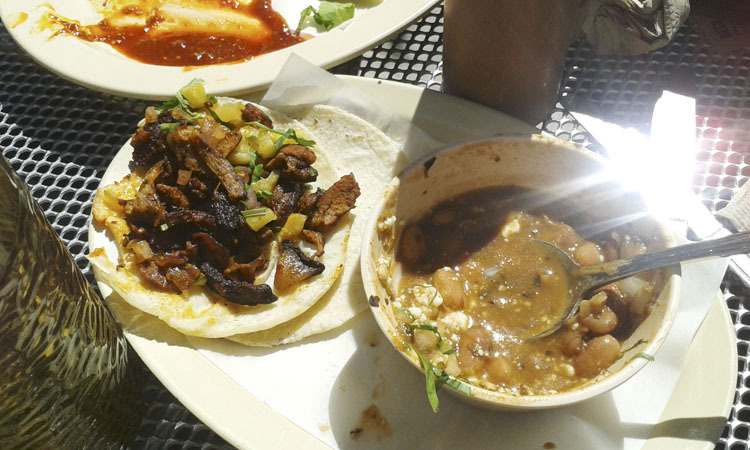 Another delish taco and really good beans- which were attacked by the family before I even got a good picture. 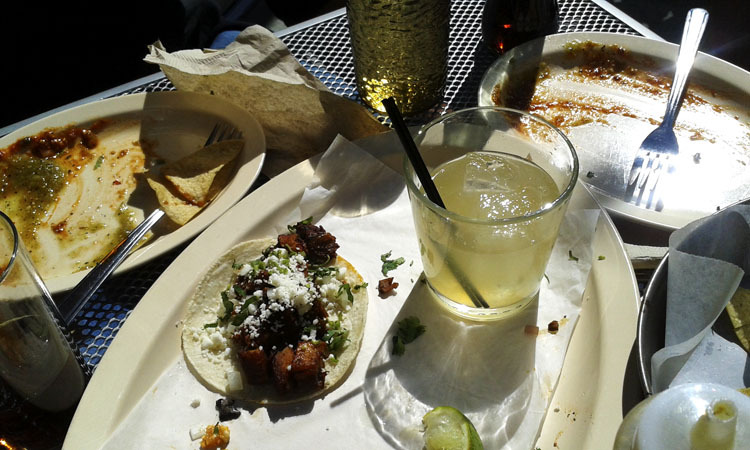 Yet another tasty little taco and the blah margarita. No matter how many pictures I take of it, it isn't going to improve. 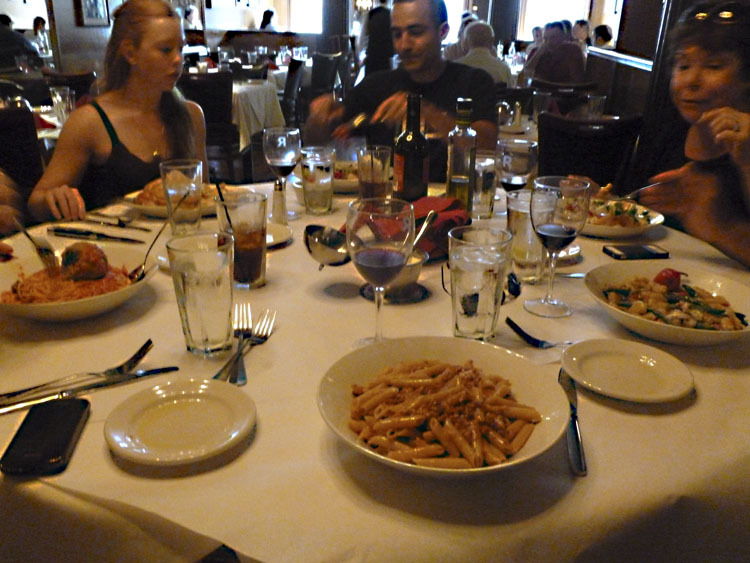 You can see how everyone else devoured their food. 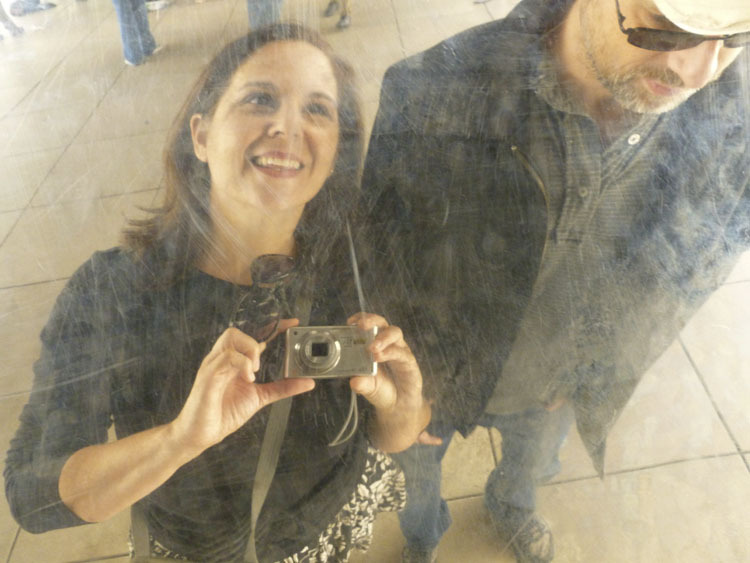 Then we got on the El to Wrigleyville and wandered around there for awhile. 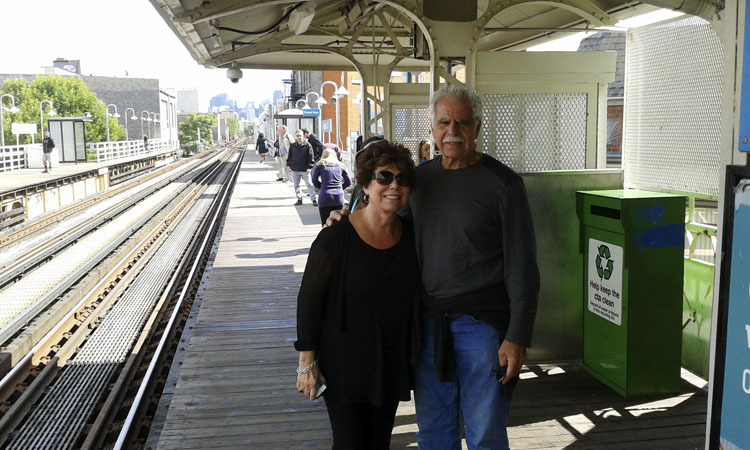 Mom and dad on the El platform. 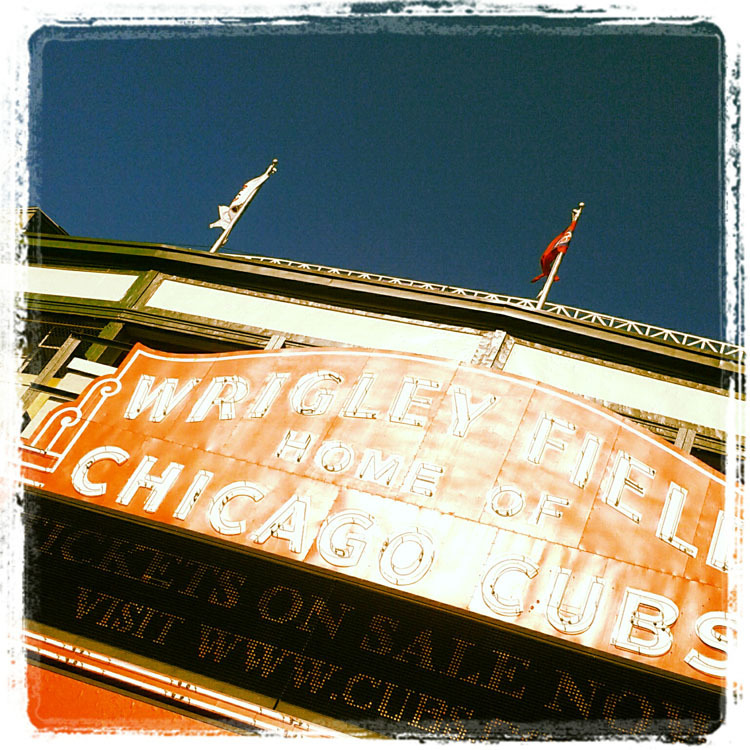 We thought about taking a tour of Wrigley Field but the tickets were $25. REALLY? Yeah. Then we had some cocktails at one of the many bars up there. After the drinks we got back on the El and went down to Fullerton in L.P. and had some hot dogs at Chicago’s Dog House. 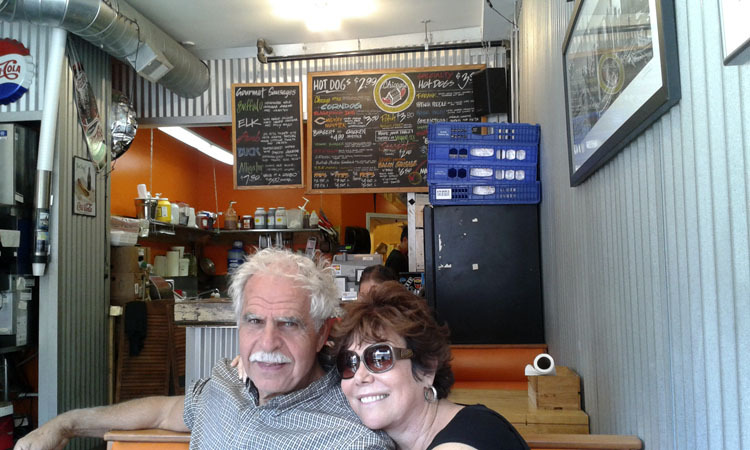 The 'rents at Chicago's Dog House. 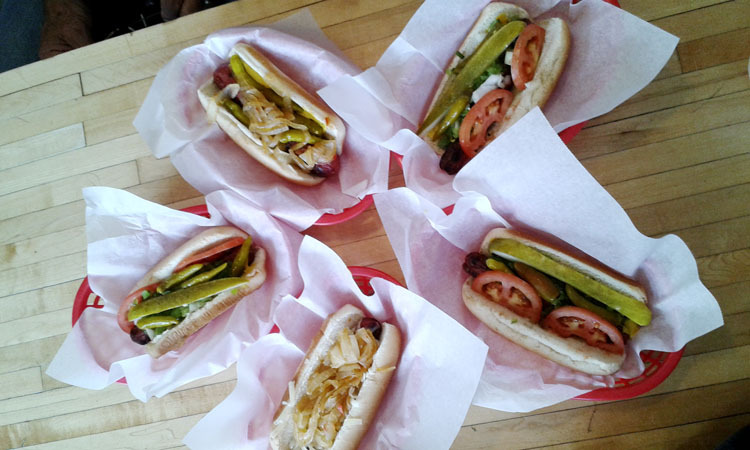 All the yummies at Chicago's Dog House. 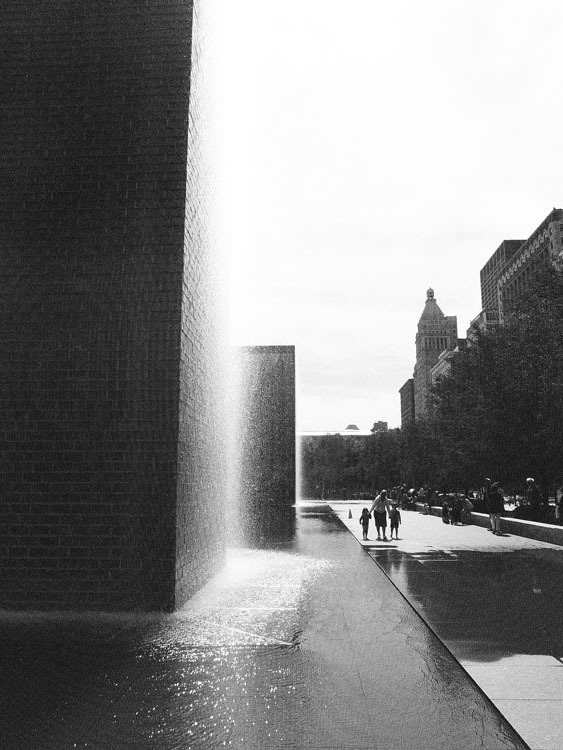 Later that evening we took an architectural river cruise with the Chicago Architecture Foundation. 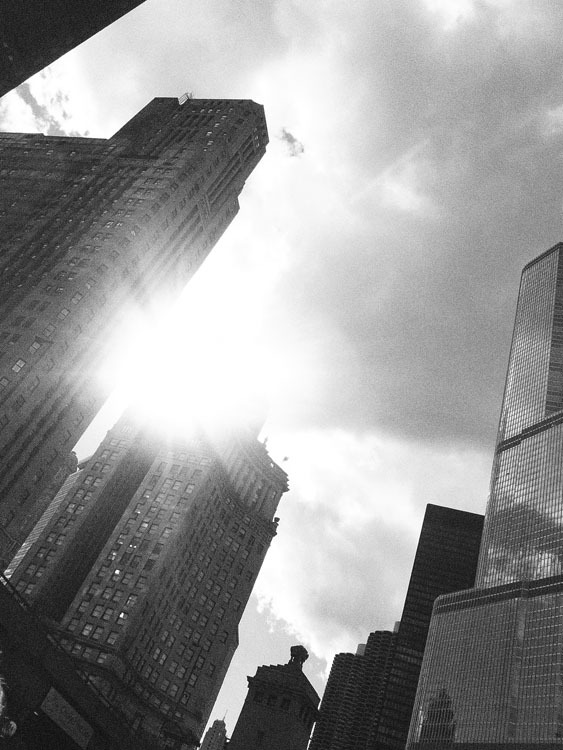 Some cool shots from the boat. CAF does great river tours, very informative and fun. 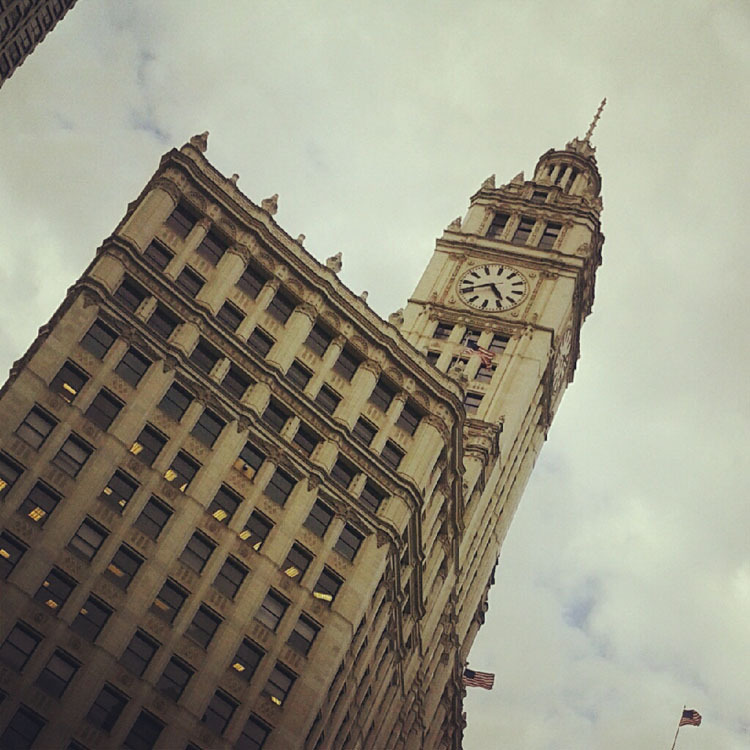 The Wrigley Building a la Instagram. After the river tour we had drinks and apps at Filini. I had another of my favorite foods ever there. 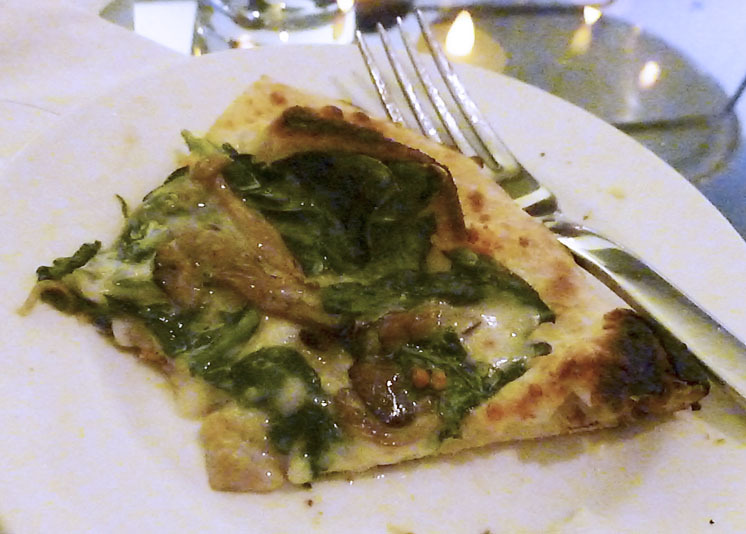 One of the best things I've ever eaten: the mushroom pizza from Filini, Chicago. 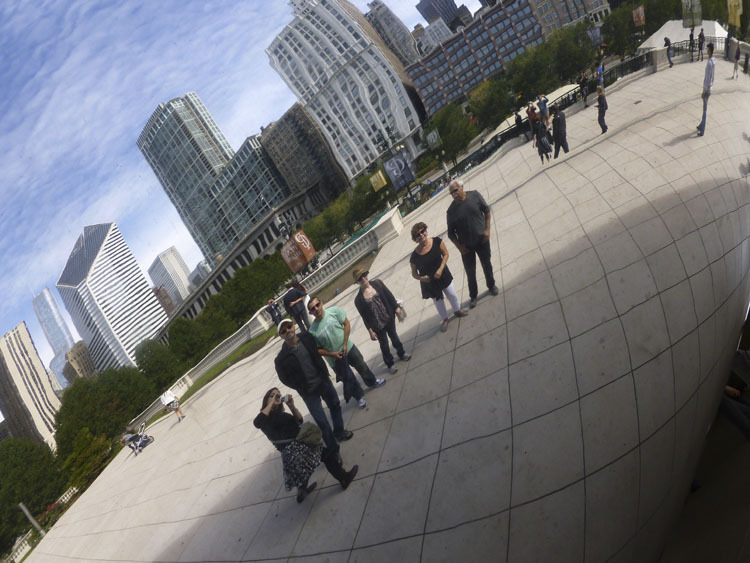 Wednesday was their last day in Chicago so we started out in The Loop at Do-Rite Donuts. 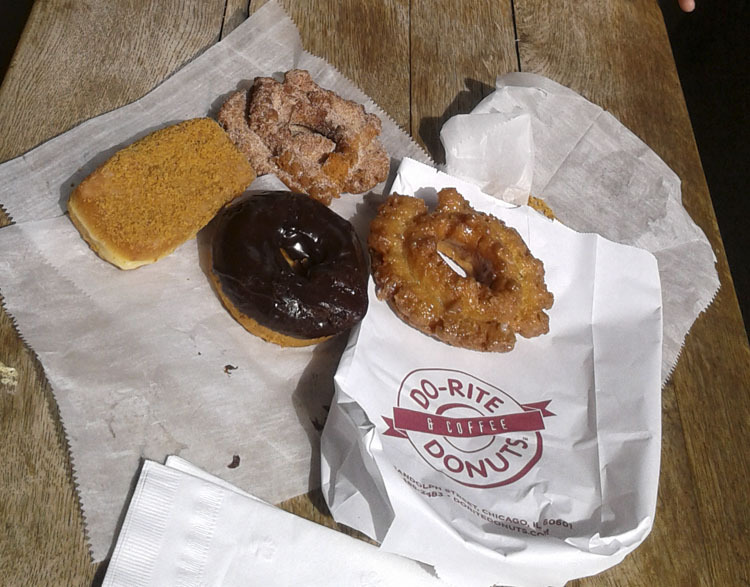 Everyone else was food-ed out, but Mike and I enjoyed the donuts very much. Rookies! 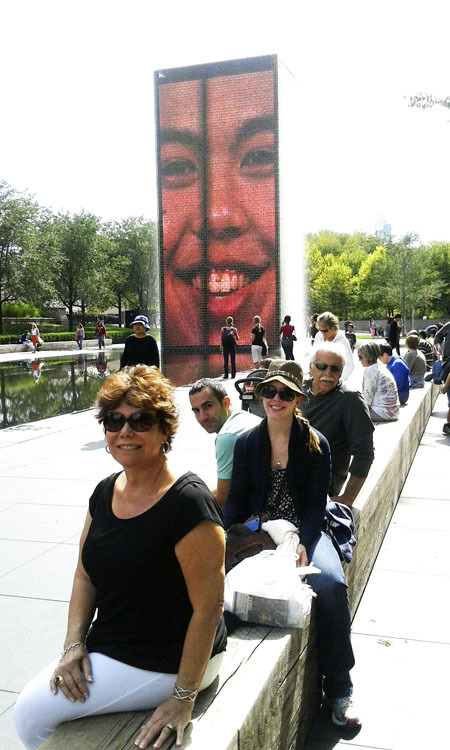 Then we just hung out in Millenium Park and had lunch at Mariano’s, the neat grocery store/cafe/restaurant by The Aqua. 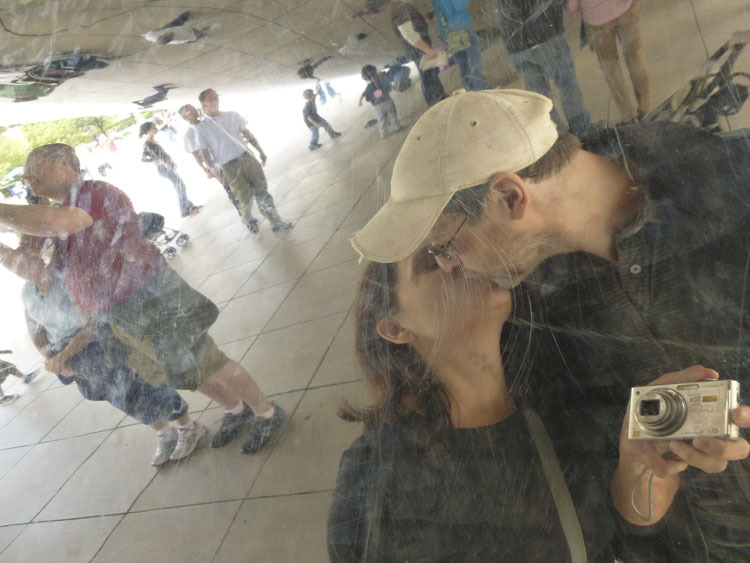 Sarah and Dave at "The Bean". 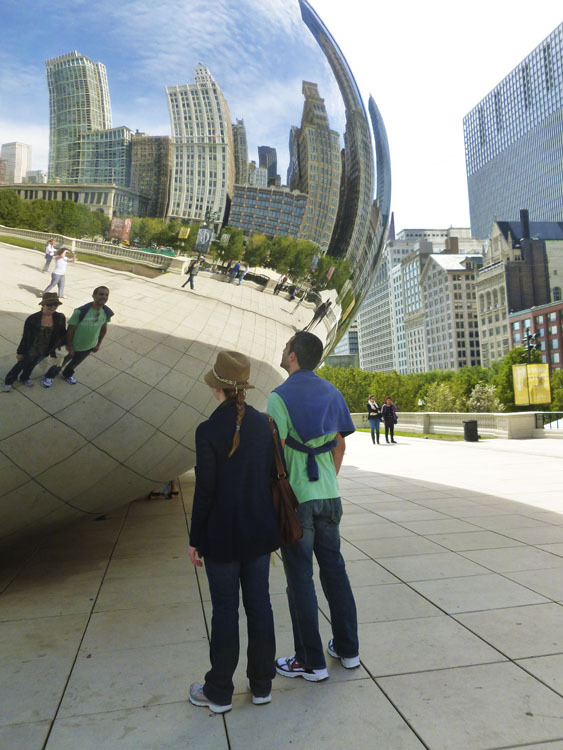 "The Bean" is really called Cloud Gate. 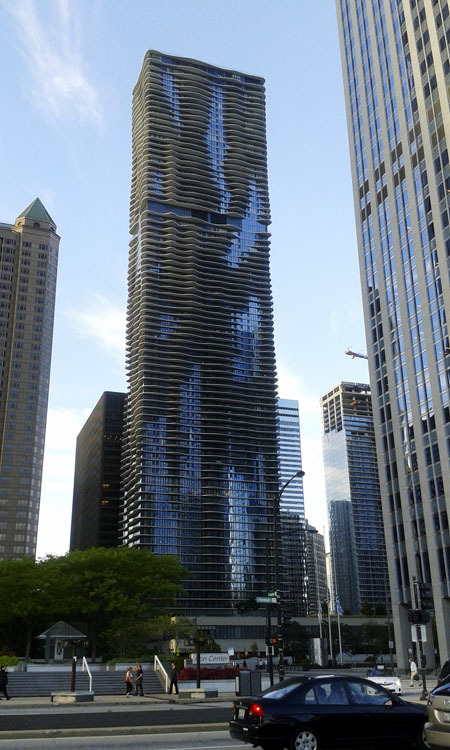 Filini is in the lobby of the Radisson Blu Hotel, which is in the famed Aqua Building in Chicago. 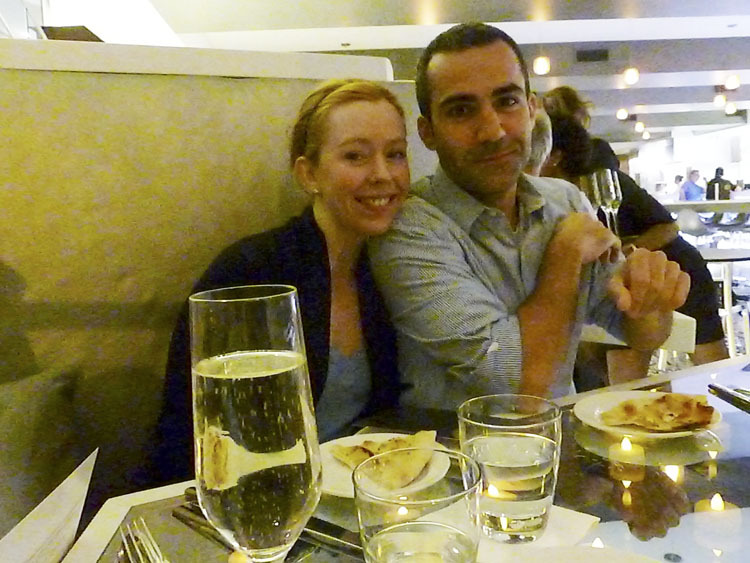 Very modern, open, airy, and pretty, with excellent food and drinks and good service. 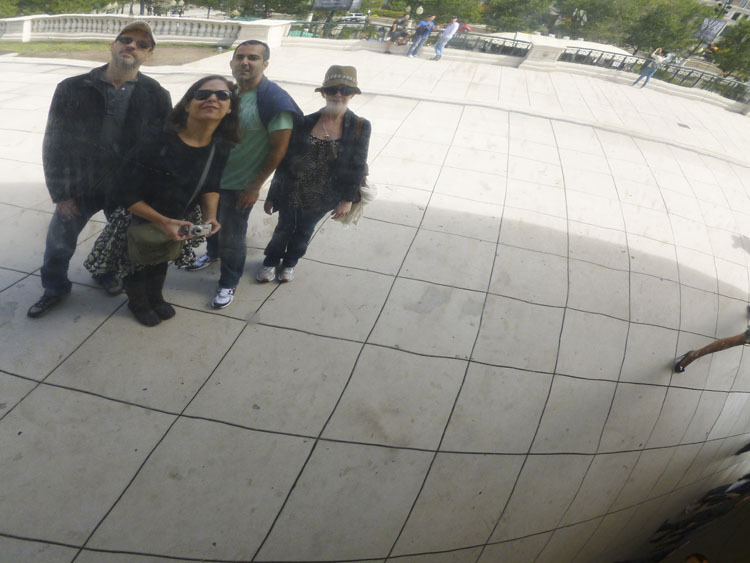 We went here and sat in the bar when my parents and my brother and sister-in-law came to visit from L.A. in September. 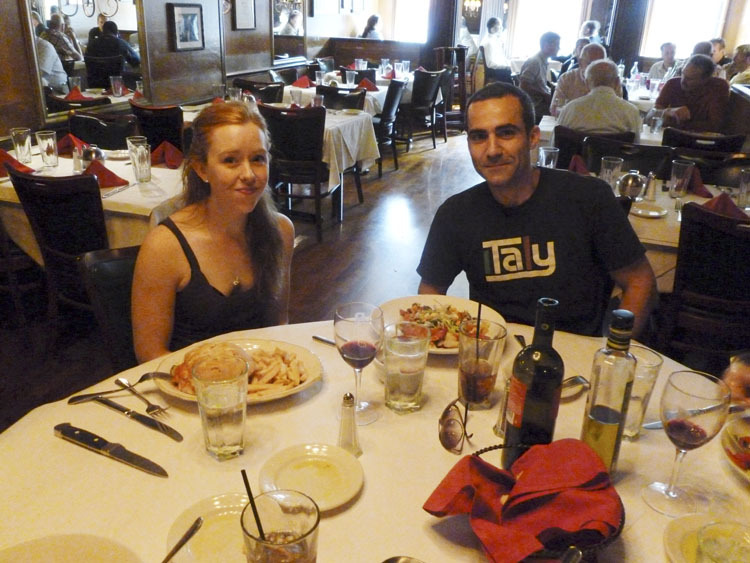 They stayed in a condo in the Aqua, so we went to Filini a couple times while they were visiting. We drank a lot of wine! Then we had a lot of food! It was really fun and a great experience. 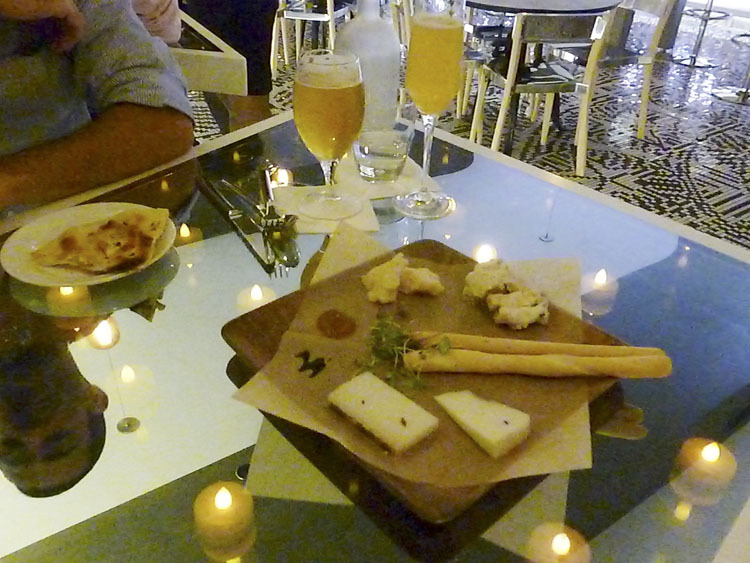 We started with a cheese plate. David had a beer and Sarah had some sort of sparkling wine, which is all the rage with the young people these days, I’ve noticed. 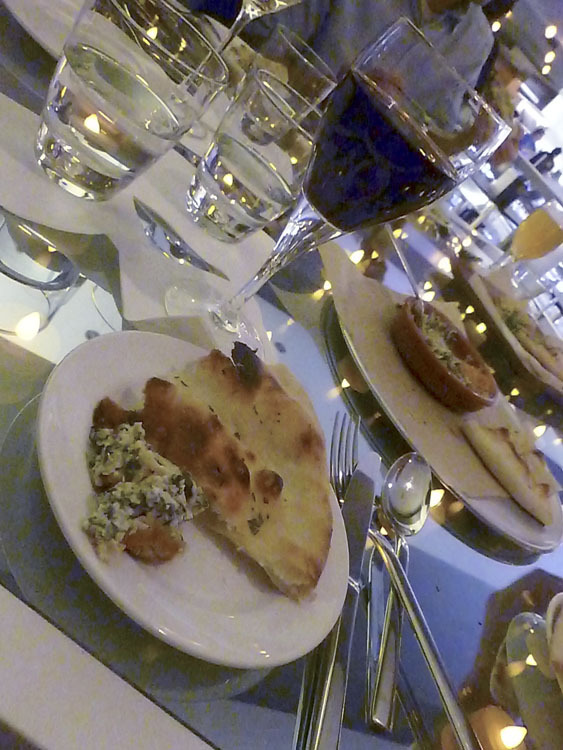 Then we had the delicious creamy, cheesy artichoke and spinach dip with some flatbreads. Mom and I shared a bottle of Sicilian red wine. We ordered a couple of pizzas including a margherita and a sausage, but this one rocked my world! 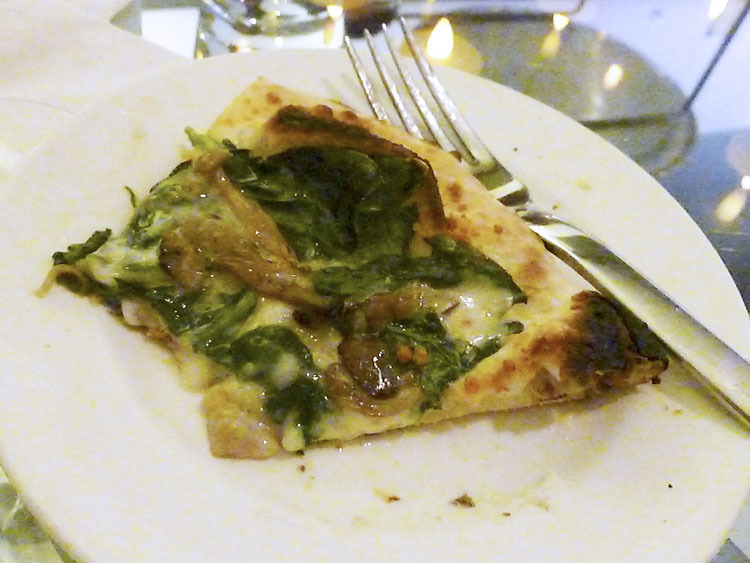 It was sauteed exotic mushrooms, spinach, taleggio cheese, and truffle oil. It was the best thing I’ve eaten in a long time. I might have to go get one right now. 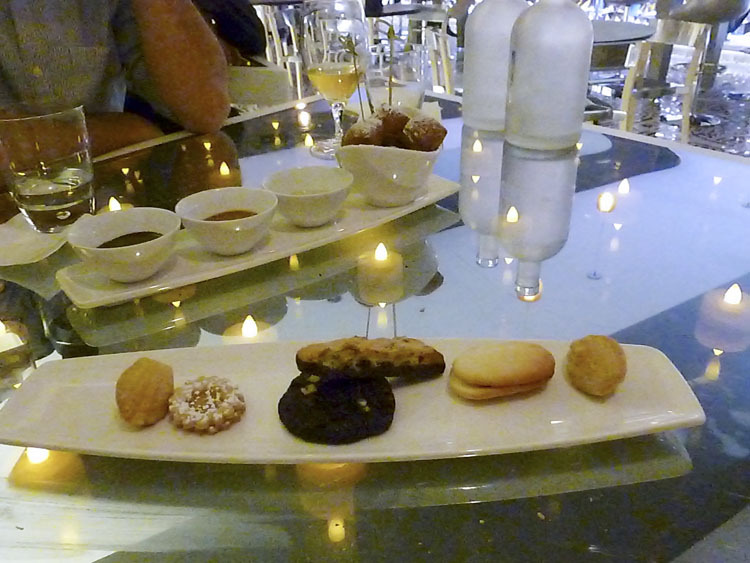 We finished the evening with some Italian cookies. 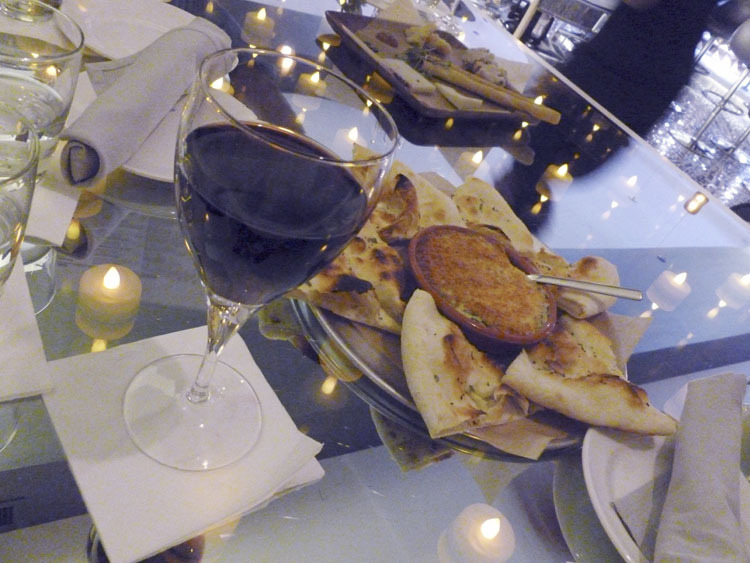 I love Filini and will go back soon! I made this pita bread recipe recently. It was really easy, really quick, and really good. Soooo much better than grocery store pita. 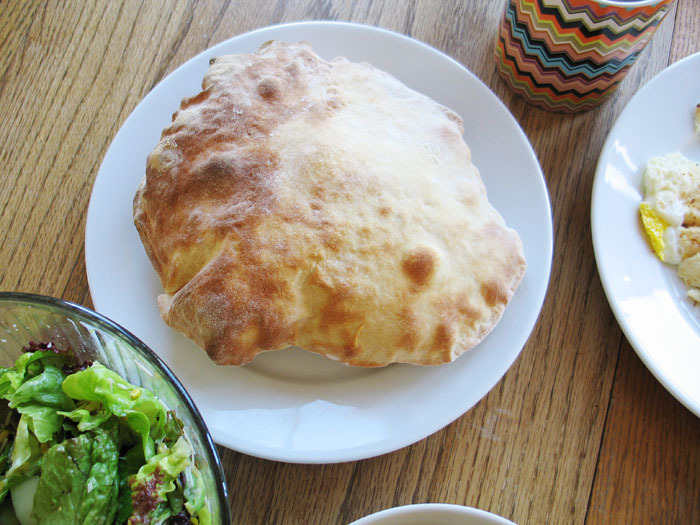 Maybe if you live in a city with lots of Middle Eastern groceries and restaurants you can get better pita than I can, but if not, then go ahead and make this, you’ll love it. I don’t have a pizza stone so I did it on my metal pizza pan and it worked fine. I could only make one at a time, tho! When I did it it made 6 pieces. So I froze some of them to bake up fresh later. Around that time, the rest of my tomatoes that I had brought inside to ripen were ripe. I wanted to use them but wasn’t sure how so I just cooked them down in a saucepan with some olive oil, sea salt, and garlic. I thought about making soup or something but they cooked down a lot so there wasn’t really enough to do anything big with. I remembered the pita dough I had in the freezer so I took it out and defrosted it in the fridge. Then I rolled it out, brushed it with olive oil, put shredded mozarella and the cooked down tomatoes on top and popped it in a 500 degree oven for 10 minutes. It was really perfect! The pita rolled out nice and thin like I like. Thinking I might use it as a pizza dough recipe again! 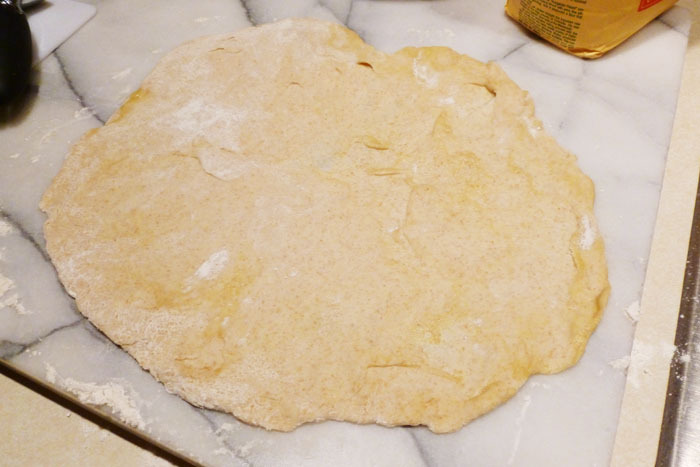 It’s not really any kind of revelation to use pita dough as pizza dough, all doughs are the made of the same basic ingredients. But still, I was pretty happy about how it turned out. 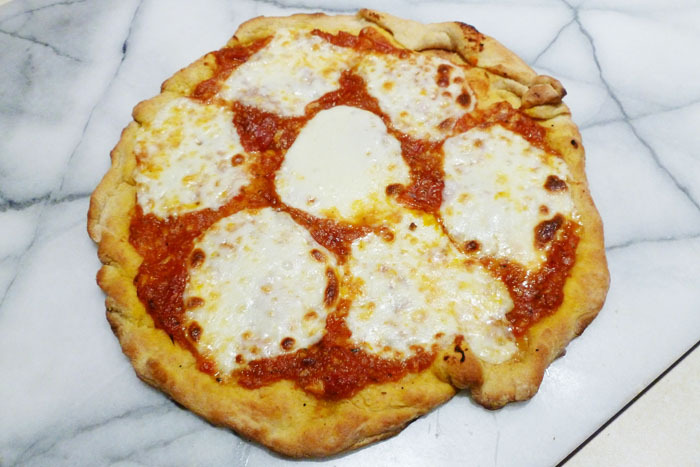 Do you have any other odd bread dough recipes you like to make into pizzas? It’s been awhile since I’ve made a pizza. We got an email asking for our crust recipe, and I also wanted to try out the new oven so I made one last week. 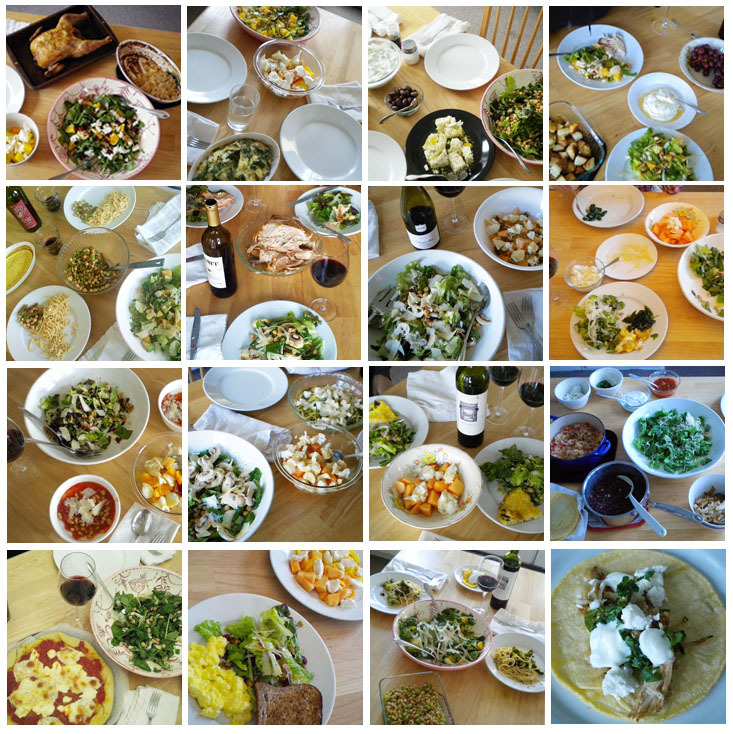 I use different recipes- I should try them all out and really figure out which one I like the best. Anyhow, this time I used one from the Greens Cookbook. Combine the milk and water in the bowl of a mixer. Add the yeast and the sugar. Stir to disolve. 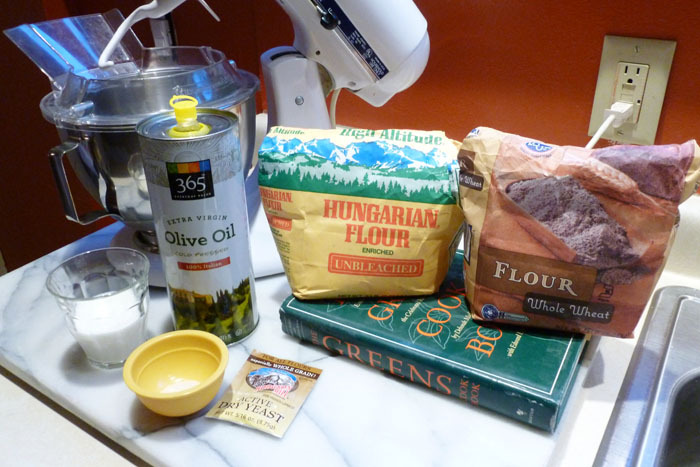 Add the olive oil, salt, and flours and mix. Sometimes it’s too dry and you might need to add a little more milk or water. I added some more milk this time, which I think made the crust softer than usual. 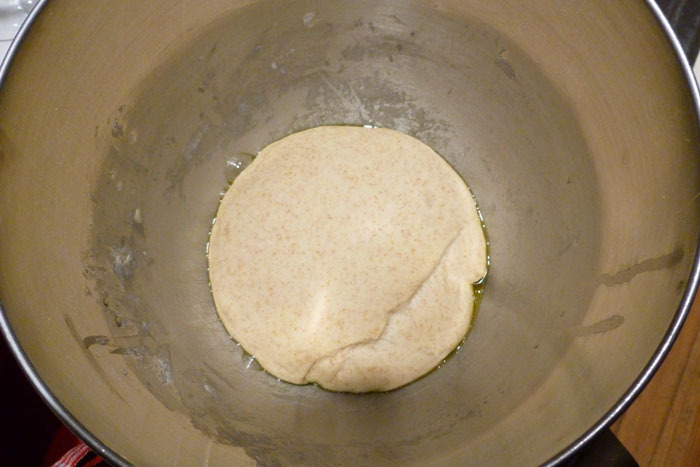 Mix the dough till it gets smooth and round. Then take it out, oil the bowl, and put it back in. 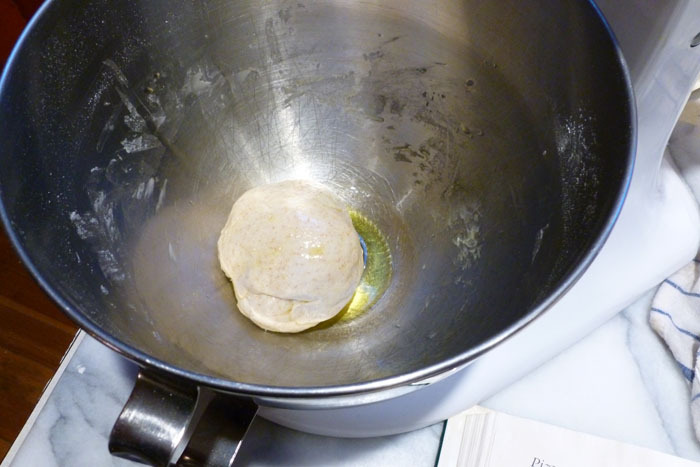 Cover the bowl with a towel, put it in a warmish place, and let it rise to double in size. This took about 2 hours for me. 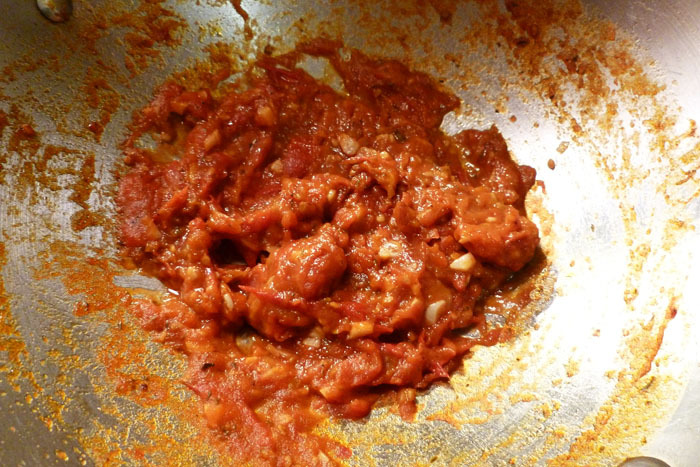 The recipe says it will take half an hour, so your mileage may vary. 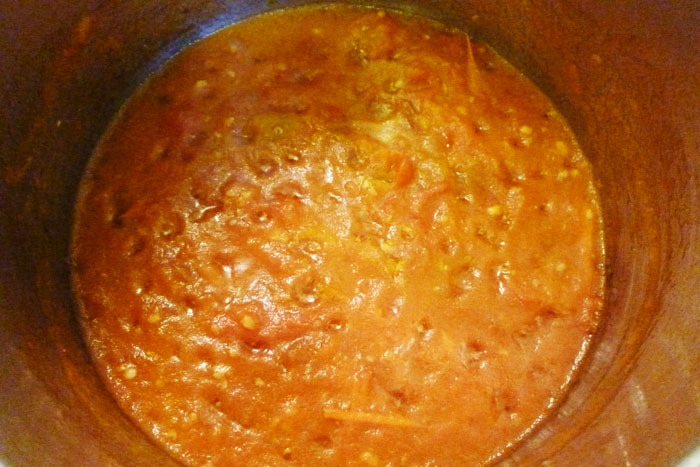 While the dough was rising, I made a tomato sauce. 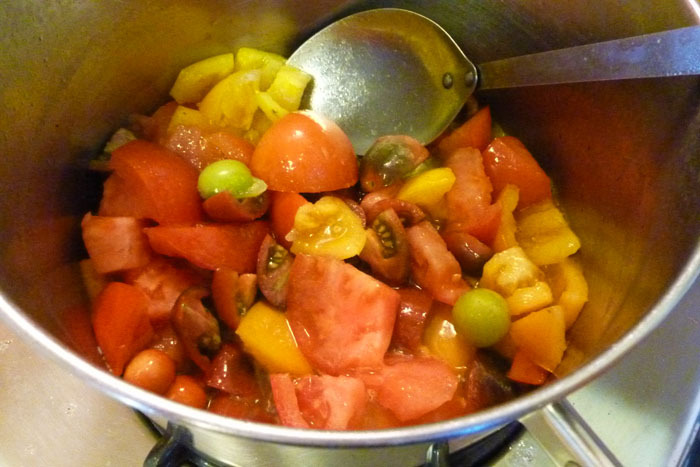 I still had tomatoes from the garden but they weren’t super tasty for eating raw, so cooking them brought out the flavor. 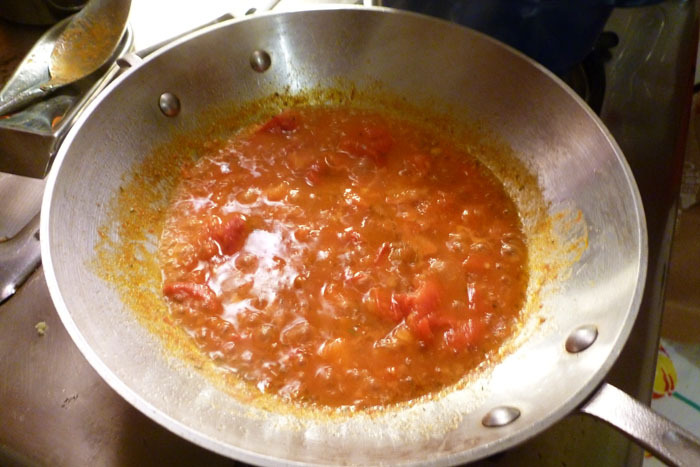 I made a really simple sauce by heating up some olive oil, adding 6 chopped tomatoes some fresh thyme and a couple of minced garlic cloves and cooking it way down, almost to tomato paste consistency. 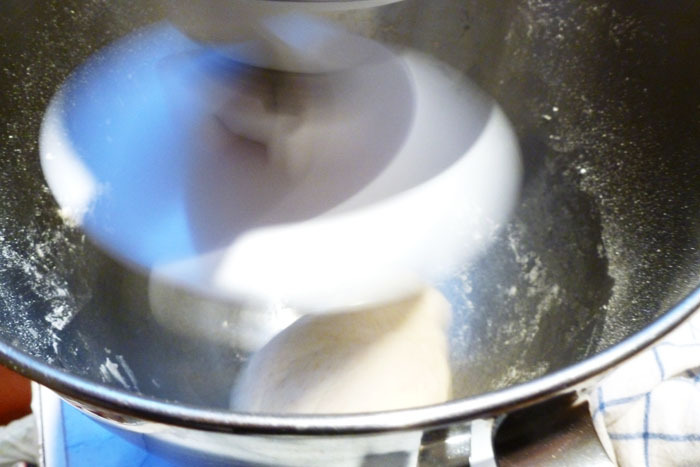 Roll out the dough- you can toss it all restaurant-like, but I usually just pull it and sometimes roll it with a rolling pin, just depending on my mood. I don’t have a pizza stone, so I just use a metal pizza pan to cook it on. 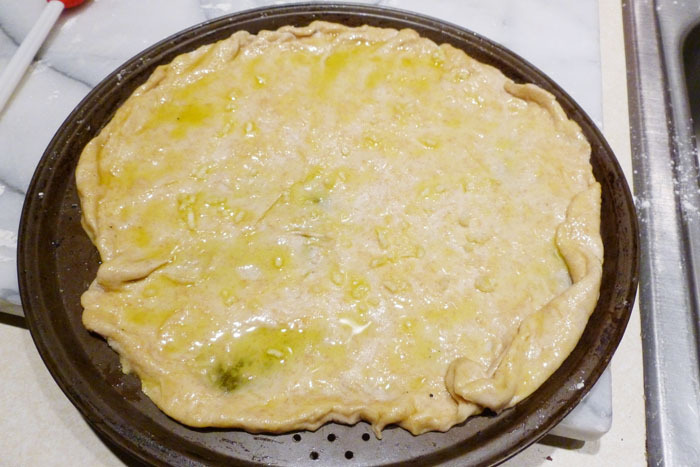 You can brush a little olive oil and maybe some garlic onto the crust before you put the topping on. It keeps it from getting too soggy. 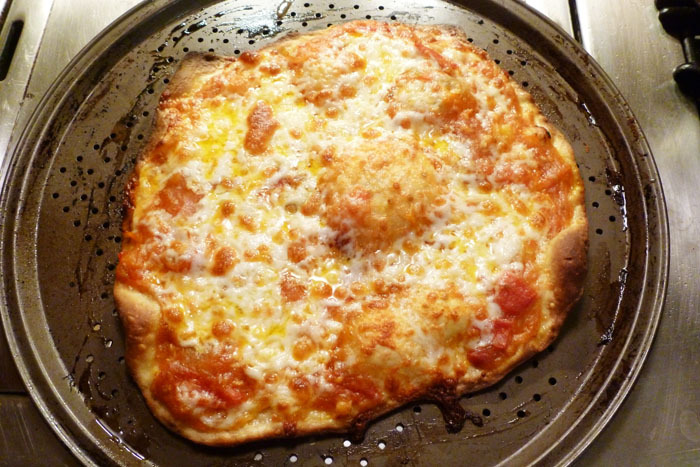 Cook the pizza for about 10 minutes or until the cheese is melted and the crust is golden brown. 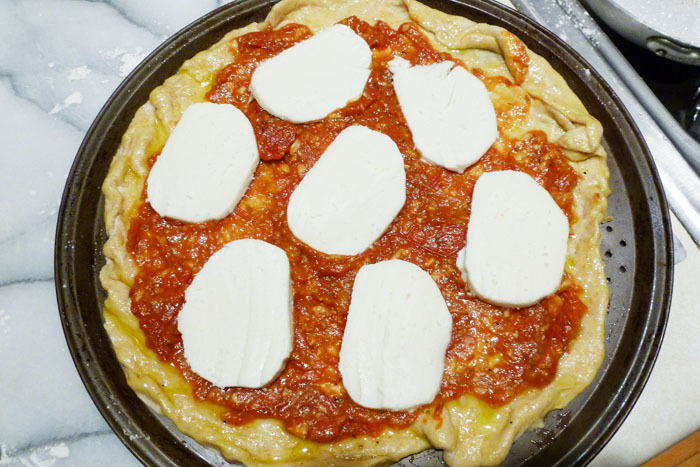 How do you make pizza at home? What are your favorite toppings? Sometimes when people see how piggily we eat, they ask “how come you’re not 300 pounds?” Well, I’m not exactly skinny. But ok, I’m not 300 pounds. It may seem like we are piggier than we actually are. We eat pretty healthy at home. In fact, since January, we’ve been on this new eating plan. Mike has lost 12 pounds! I have not. Of course. But I HAVE saved 30% on my grocery bills. Basically we eat a very large but light meal in the early afternoon. Then at night we have something light like soup or a sandwich. Our lunches consist of a big salad, then either some chicken, or eggs/fritatta, or a pizza, or some pasta/lasagne, then some sides like sauteed or steamed veggies/potatoes/beans/cheese, and always fruit. We almost always have a glass of wine, too. A SMALL glass of wine. I’ll go into more details about each thing in the future, but for now, here are some pictures of what we’ve been eating.